Discussion in 'The Lounge' started by Willie Oleson, Oct 29, 2018. Unfortunately I got rid of them, but I still remember many of those illustrations. Yesterday I searched the internet to see if someone has uploaded some of those pictures but, unless you know the name of the obscure illustrator, all you get is Disney since that seems to be the standard. I love Disney, but that's not what I was looking for, not this time anyway. Via-via-via several websites I found the names of those illustrators (mostly Italian, I think) and then pinterest did the rest. This is not a very useful thread and I have nothing more to add, so I'll just post some of those pictures. Btw, if you're reading this and you still got one of those books, and you would be able to scan and upload some illustrations, that would be awesome. Many of those vintage children book's were released in different countries so maybe there's more that I'll recognize. The wolf, the witches and the evil stepsisters were my favourites (although most villains happened to be female) so those pictures were my priority. These images are really very old (1950s?) but they were reissued over and over again so eventually they ended up in a 1970s print. Beautiful artwork! Thanks for sharing. I just love the colours these artist used. The Sleeping Beauty is probably my favourite of these. I have quite a large collection of fairy tale books because I do a fairy tale unit with my class. I don't have any of the versions with the images you posted @Willie Oleson but I feel like I remember some similar to those from my childhood. I thought Mother Goose was the Charles Perrault stories? Mother Goose for me growing up was nursery rhymes like Jack and Jill, Hey Diddle Diddle, and Little Jack Horner. 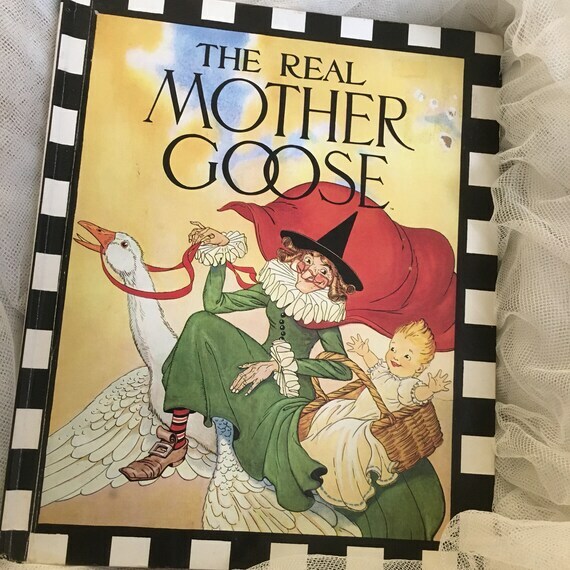 The figure of Mother Goose is the imaginary author of a collection of French fairy tales and later of English nursery rhymes. As a character, she appeared in a song, the first stanza of which often functions now as a nursery rhyme. This, however, was dependent on a Christmas pantomime, a successor to which is still performed in the United Kingdom. 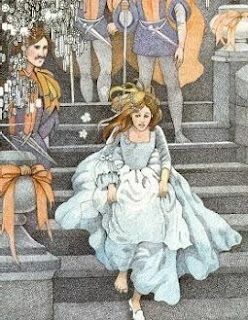 The term's appearance in English dates back to the early 18th century, when Charles Perrault’s fairy tale collection, Contes de ma Mère l'Oye, was first translated into English as Tales of My Mother Goose. Later a compilation of English nursery rhymes, titled Mother Goose's Melody, or, Sonnets for the Cradle, helped perpetuate the name both in Britain and the United States. So...Mother Goose is...well, this or that. Or something else! Speaking of goose, do you know this game in America? I'm not familiar with that game. It looks cute. I'm wondering why one of the geese is incarcerated? I'm wondering why one of the geese is incarcerated? I think it means you have to skip a turn. The dead goose means you have to re-start the game from the beginning. Maybe it's the comic book style that makes these images look less "static" than the traditional children's book illustrations. Another Benvenuti, but it's not the queen from Snow White. It's from the "Six Swans" story, if I remember correctly. Nevertheless, she looks terrifically terrifying. 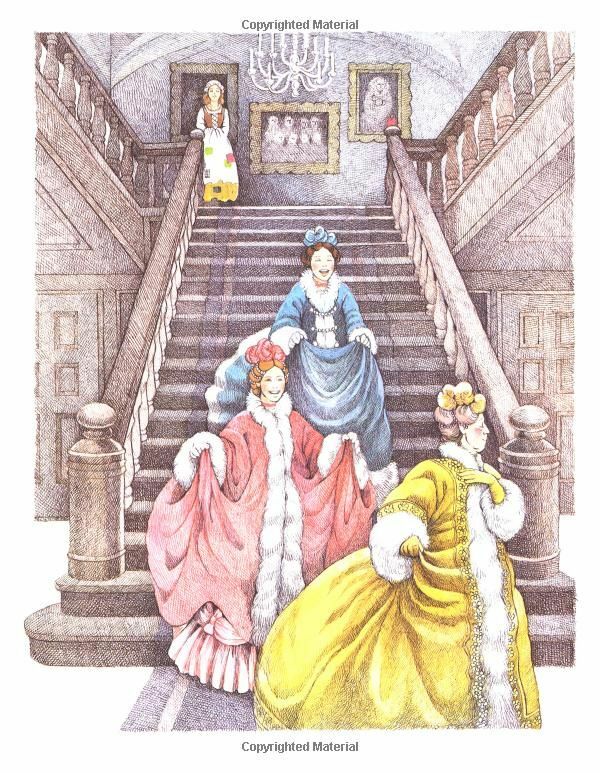 This is from another relatively obscure fairy tale but I honestly can't remember what it was. It could be "Frau Holle" but there are quite a few versions of the beautiful lovely stepsister vs. the ugly evil stepsister. Apparently, the punishment of "evil" at the end of the story was that frogs would come out of the mouth of the ugly stepsister, every time she spoke. Nice story for little children! Thanks to pinterest I stumbled upon the wondrous world of American illustrator Scott Gustafson. Amazing stuff, how come I had never seen this before? I'm thinking the same thing. When I was reading (or being read to) these stories as a child the artwork was never this impressive.